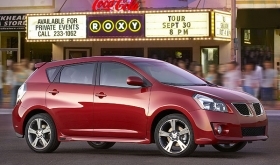 GM will halt production of the Pontiac Vibe by the end of August. DETROIT -- Online consumers are bailing out of buying Saturns, Saabs and Hummers even before General Motors can unload those brands to their new owners, according to Web analysis firm Compete. And because two-thirds of Saturn and Pontiac shoppers buy only that brand or non-GM brands, that provides a prime opportunity for rivals to pick off those buyers. "They are not big GM people. Those people are at risk to GM," said Dennis Bulgarelli, director of Compete's automotive practice. He noted that the number of consumers shopping for Saturn and Pontiac online plummeted in the fourth quarter, when GM announced plans to sell Saturn and make Pontiac a niche brand. GM later decided to kill Pontiac entirely. Saturn's shopper counts are now at a five-year low, with Pontiac approaching its all-time trough. While Toyota, Ford and Honda are the top three brands also looked at by Saturn and Pontiac prospects, there might still be opportunities for other automakers besides GM to attract those potential car buyers. But, he added, most carmakers target their products against a competitive set of brands and "never look too hard outside of that," Bulgarelli said. Time is of the essence here, because the window of opportunity won't be open forever; GM has said it expects to close the sales of Saturn, Saab and Hummer by the end of the third quarter. Saturn is going to Penske Automotive Group; Saab to a group led by high-end Swedish sports-car maker Koenigsegg Group; and Hummer to China's Sichuan Tengzhong Heavy Industrial Machinery Co., a maker of construction, road and bridge-building equipment. GM changed its plans for Pontiac in late April, saying it will be phased out by the end of 2010 and rather than become a marque with a couple of models; GM will halt production of the Pontiac Vibe by the end of August. Saab and Hummer are such niche brands that they are only get some 10,000 to 12,000 shoppers monthly, Bulgarelli said. So what should GM rivals do to pick up online Pontiac and Saturn shoppers? Bulgarelli recommends determining what Web sites they visit to place ad messages there. He also said to determine the lifestyle interests of Pontiac and Saturn shoppers and show up at events that cater to those interests, or buy broadcast or print ads in related media properties. All is not lost for GM, he said. The automaker can target these potential defectors with messages that there are great deals on Saturns and Pontiacs. The automaker can also tout future Chevrolet products for consumers not in the market right now.